Artistic impression of AR Scorpii, the first discovered white dwarf pulsar. 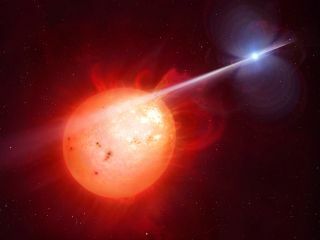 Recent observations of an elusive white dwarf show that the star acts more like a pulsar, whipping its companion star with a powerful beam of radiation as it spins rapidly. A pulsar is a type of neutron star — the densest objects in the universe besides black holes. Neutron stars form when a massive star explodes and then collapses in on itself; a pulsar is unique because it emits a steady beam (or beams) of light as it rotates. In this case, however, the pulsar is a white dwarf star, or the burned-out remnants of a low-mass star that has collapsed in on itself, but is not nearly as dense as a neutron star. AR Sco lies approximately 380 light-years from Earth and is about the same size as our planet, but 200,000 times more massive. AR Sco is part of a binary star system (meaning it orbits a stellar companion) and resides approximately 869,900 miles (1.4 million kilometers) from its companion, a red dwarf star. Previous research established that AR Sco is striking its stellar neighbor with a powerful radiation beam, causing the binary star system to glow and dim every 2 minutes. What's more, the radiation beam accelerates the electrons in the other star's atmosphere to almost the speed of light, according to the statement. "AR Sco is like a gigantic dynamo: a magnet, size of the Earth, with a [magnetic] field that is about 10,000 [times] stronger than any field we can produce in a laboratory, and it is rotating every two minutes," Boris Gänsicke, co-author of the study and an astrophysics professor at the University of Warwick, said in the statement. "This generates an enormous electric current in the companion star, which then produces the variations in the light we detect." Building on previous observations, the recent study shows that "the lash of energy from AR Sco is a focused 'beam,' emitting concentrated radiation in a single direction — much like a particle accelerator — something which is totally unique in the known universe," according to the statement. AR Sco's oscillating brightness is "a dead ringer for similar behavior seen from the more traditional neutron star pulsars," Tom Marsh, study co-author and astronomer from the University of Warwick, said in the statement. The new study was published Jan. 23, 2017, in the journal Nature Astronomy.